Summer fruits are at their peak and so are summer pies. 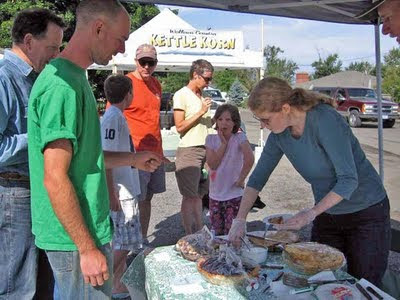 Wallowa County has some talented pie makers (and many dedicated tasters) and in Joseph on Saturday, August 29th they showed us what they could do. 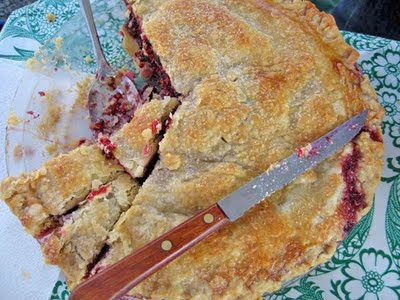 Digging into my heaping plate of pie, I savored peaches, blackberries, blueberries, raspberries, and even a mouthful of popcorn pie (pronounced an excellent invention by our many tasters.) I sampled crusts, from crumbly to flaky to cookie. What better task could there be? All the pies were good and it was very hard to choose—I considered going back for seconds to help me make a decision. The sun-warmed, juicy blackberries won me over in the end and I marked down my vote with the satisfaction only a belly full of good pie can bring. Thank you to all the participants for making this a great contest!